The thought of the beginning of August and how we are now halfway through Summer makes me feel a little disheartened. Summer is my favorite time of the year- I just love everything about it- the long days full of sunlight, the fireflies at dusk, the freshest of fruits to toss into deserts and the nice outdoor family outings. I'm trying my best to soak up the heat in hopes of preserving some for those long chilly winter months and until then I will enjoy every single moment of summer that's left to it's utmost. During Summertime I try my best to avoid preparing any dinner dishes that need alot of time in the oven. The heat of the oven is just too much for my small apartment to handle, it gets too stuffy and sweaty. Instead I prepare meals like: meat salads, sushi, pasta, fried breaded chicken, fish or meats and any other dishes that can be prepared quickly on the stove top, cooked on a grill or fried in a deep fryer. This dish did go in the oven but on a very low temperature to stay warm until being served. So it didn't cause an over abundance of uncomfortable heat in the house. This recipe was incorporated/inspired by one I saw in the Taste Of Home magazine. I've seen the idea of crushed potato chips, potato sticks, the more typical bread crumbs or cornflake crumbs to be used as breading for chicken. I've even prepared one that had tortilla chip breading. I try to get a little more creative in preparation of good old boring chicken but I'd never done this with pretzels. It was a wonderful twist to what otherwise could have been a pretty dull dish. 1. Start by preparing your breading station- lay out 3 shallow dishes. Put the flour in the first dish. 2. Pour the pretzels into a food processor or blender and process into very small pretzel bits. (If you don't have a machine put them in a plastic bag and smash down with a meat hammer this just takes much more time) Put the prepared pretzel bits in the second dish. 3. Whisk together the Eggs, Almond Milk, Salt, Pepper and Fresh Garlic and place that mixture in the third dish. 4. Lay the dishes out in order as it will be easiest for breading. The flour dish first, then the egg mixture and last the small pretzel bits. 5. Take the chicken cutlets and gently pound each piece on both sides with a poultry/meat mallet to make them even thinner. 6. Then start "breading" them one at a time: Coat them completely in flour then in the egg mixture and lastly in the pretzel bits. Carefully Put already pretzel coated pieces of chicken in a fourth dish to the side to be fried later. 7. Once you have finished the process of breading all of the chicken pieces you are ready to fry them. Put a little bit of veg. oil into the bottom of a nonstick frying pan. Start a flame underneath it starting out low until it's sizzling and then bringing it a little higher to about a medium heat. Add the pieces of chicken about 3-4 at a time depending how large the frying pan is. Try to avoid overcrowding as it can cause them to burn. Let them fry for about 4-5 minutes on each side or until they are no longer pink on the inside and have a nice pretzel crust on the outside. 8. 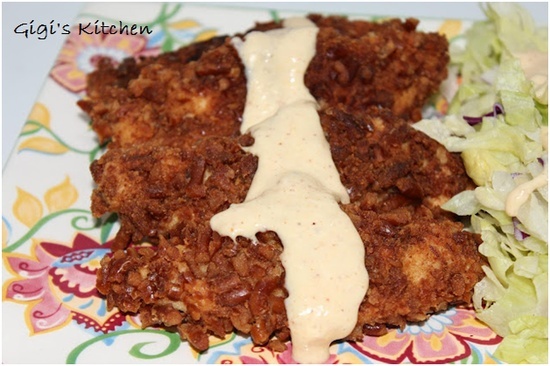 Remove already fried pieces of chicken to a paper towel lined plate to allow any excess oil to drip off. 9. Prepare your sauce/dressing- Combine 1/4 Cup Honey Dijon Mustard, 1/4 Cup Mayonnaise, 2 Tablespoons Vinegar and 1/2 Teaspoon of Garlic Powder in a medium bowl. Whisk together till smooth and creamy in consistency. 10. Plate the Pretzel Crusted Chicken with about a handful of Salad Greens to the side of it. Either, Put the sauce/dressing in a container to be refrigerated if you are not serving right away. Or, Spoon desired amount over the top of the chicken and salad both as a double purpose sauce and dressing if you will be serving right away ( you can also serve the dressing/sauce to the side so that each person can take a specific amount to their liking).